Program launches fine, even loads games just fine (the one I tried anyway). 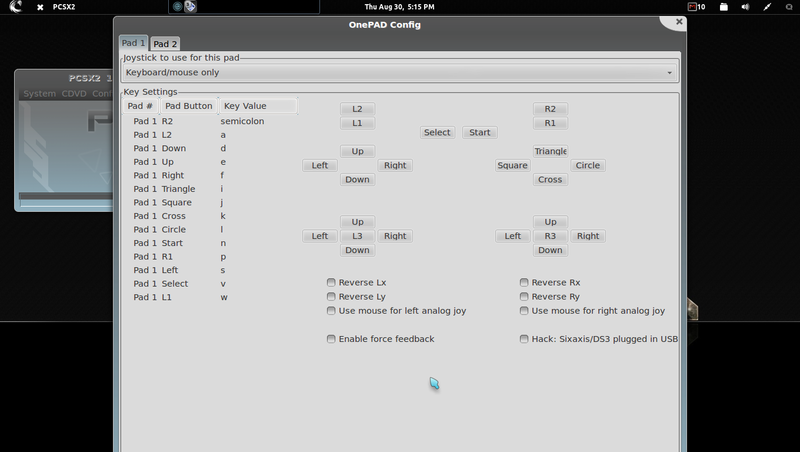 Problem is that when I go to configure my controller the configuration window extends past the bottom of my screen. So there are no buttons to press to apply my settings. It is the only program that does this. (08-31-2012, 12:48 AM)Luke_H Wrote: Hello. Not a clue as to how to set that. Or what I am even looking at. Can't find anything on Google about manually setting the config files. Woop, at least we are getting somewhere. Can you try and map at least one setting whilst that config is open? (Refresh the config page whilst the new map is set) and see what it looks like. (08-31-2012, 02:52 AM)Luke_H Wrote: Woop, at least we are getting somewhere. That didn't do anything. The only window size options in any of the ini files is for the log window and the GS window. And while it will give me the option to resize the window with a right click, It will only resize the window horizontally. What kind of resolution do you have? (08-31-2012, 08:28 AM)gregory Wrote: What kind of resolution do you have? i had the same problem just hit tab until the last checkbox hit tab one more and press enter and you are done. For the moment try to use press alt ( or ctrl depend of the window manager) then you can move around with either left|middle|rigth click (depends of window manager). Don't have time for the moment but I guess we can move around a bit the frame to reduce the window heigh (or reduce some margin).